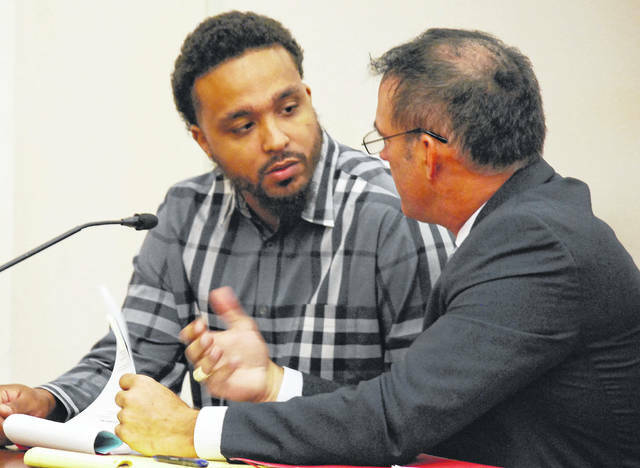 Shay Williams, 29, of Lima, converses with his attorney, Tom Kollin, during a hearing Thursday morning in Allen County Common Pleas Court. Williams is charged as a dealer of drugs in Allen County with five counts of trafficking and/or possession of cocaine filed against him. Two counts would require Williams to forfeit $49,938 if convicted, while another count carries a specification labeling Williams as a Major Drug Offender, a designation that carries a mandatory 11-year prison term in addition to any other sentences handed down. LIMA — A Lima man indicted by the July session of the Allen County grand jury as a major drug offender and large-scale dealer of cocaine appeared in court in street clothes Thursday, already having posted a $1 million bond to be released from jail pending trial. Shay Williams, 29, formally entered pleas of not guilty to five charges returned against him by the grand jury. The most serious of those charges, a first-degree felony count of possession of more than 100 grams of cocaine, includes a specification labeling Williams as a Major Drug Offender — a designation that carries, upon conviction, a mandatory 11-year prison sentence to be served consecutively to any other sentences. Another specification contained in that count calls for the forfeiture by Williams, if convicted, of $49,938 which prosecutors says was derived from the sale of illicit drugs. The indictment against Williams also included three counts of trafficking cocaine in the vicinity of a school and one count of possession of between 27 and 100 grams of cocaine, with a specification for the forfeiture of cash. Williams was indicted on similar charges on June 13 — one day before the FBI carried out several early-morning raids in Lima and apprehended what were described as large-volume dealers of cocaine and crack cocaine. The June indictment charged Williams with two counts of first-degree felony counts of trafficking in cocaine, each with specifications labeling him as a Major Drug Offender. During Thursday’s hearing, Williams’ attorney, Tom Kollin, of Beavercreek, asked Judge Jeffrey Reed for a reduction in the $1 million bond previously ordered for Williams. A separate $200,000 bond was ordered in the earlier case, and Kollin said Williams’ family members had “put up their homes” as collateral to get the defendant out of jail. He asked Reed to lower the bond for his client to reduce the “financial burden” on his family. Assistant Prosecuting Attorney Ken Sturgill opposed that request, saying Williams poses “a real flight risk” based on the serious nature of the charges against him and the potential penalties those charges carry. But Reed agreed with the defense motion and set bond for Williams at $200,000 cash or surety in each of the two cases.